Hey everyone! Today’s post answers a request from one of our readers and features two not-so-common visualizations that you can use to make time comparisons: slopegraphs and bumps charts. Although these objects have a very simple nature, they’re also quite elegant and intuitive, so there’s a good chance that they will help you get some unexpected insights in your analyses. When working with these charts, our brain can easily spot patterns and recognize the distinctive slopes of certain elements in terms of direction or magnitude. It is also an intuitive way of showing how the rankings changed from a point in time to another, as the lines will intersect each other and end up in a different order. 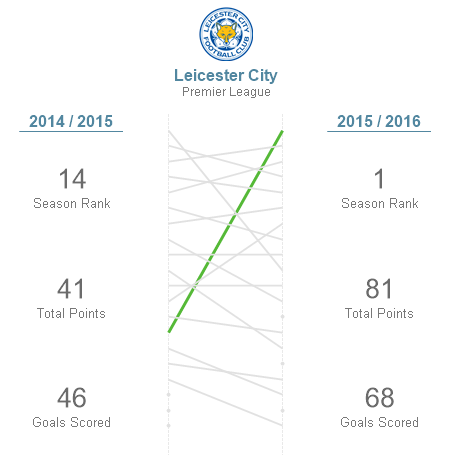 In this example, we can visualize the performance of all the teams in the Premier League over the last two seasons. 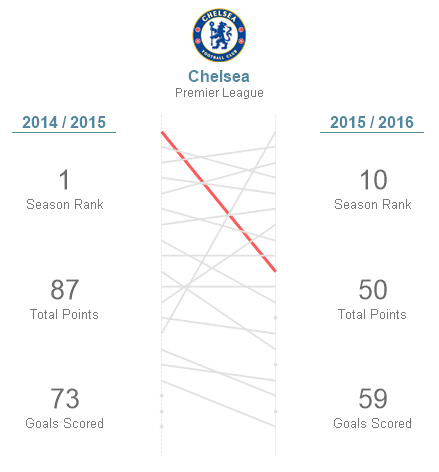 Each squad is portrayed by a line and its position and slope depend on the rank achieved in both the 2015 and 2016 tournaments. In order to improve the chart’s readability, you can highlight the selected team by adding some color and changing its line’s width.